FederalCourt.Press is an appellate court legal printer that has the highest standards for quality. The contrast of the print is exceptional, the binding is sturdy, and the heavy papers and coverstock used are luscious to the touch. 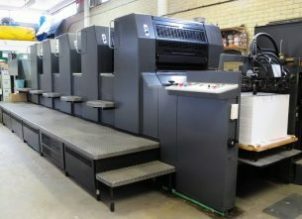 The printing presses are the newest generation of technology, the Xerox iGen 150 Digital Printing Press which offers stunning image quality and production speed. These presses are continuously maintained, so that the text quality is always exceptionally sharp. The trimming is digital so that it produces booklets that have perfectly even edges. The bindery uses advanced guidance and is kept clean, so that the binding is strong, can withstand repeated handling, and so that the text that is evenly balanced on the page. Why can’t other printers match the quality of the Supreme Court Press? Quite often, they are using very low-grade machines, the equivalent of photocopiers. They don’t maintain their equipment properly and they try to cut corners on paper and cover stock. In addition, they frequently use manual trimming and binding which leads to an even edge, booklet sizes, and frayed edges. Faded images, the result of cheap inks, dirty equipment, or old machines. The text that is bound to close to the binding, making it difficult to read text close to the middle, or requiring the binding to be broken open. Weak binding that comes apart. Globules of glue on poorly applied perfect binding.